If you’re into web design, you’ve most likely heard of PSD2HTML more than once. Back in 2005, they were the first team of this kind, providing design to HTML/CSS conversion services. Today they are still the industry lead with their massive staff capacity and high customer demand. Alongside an infographic with five fun facts about the company, we have a total value of 500 Dollars in services to give away. Don’t miss out on an opportunity to save time and sanity and get your site professionally developed with no hassle. Read on for the details. The PSD2HTML team of 470+ employees speaks 14 languages, lives in 11 countries and represents 23 nationalities. 4k is the largest number of pages coded by a single developer. 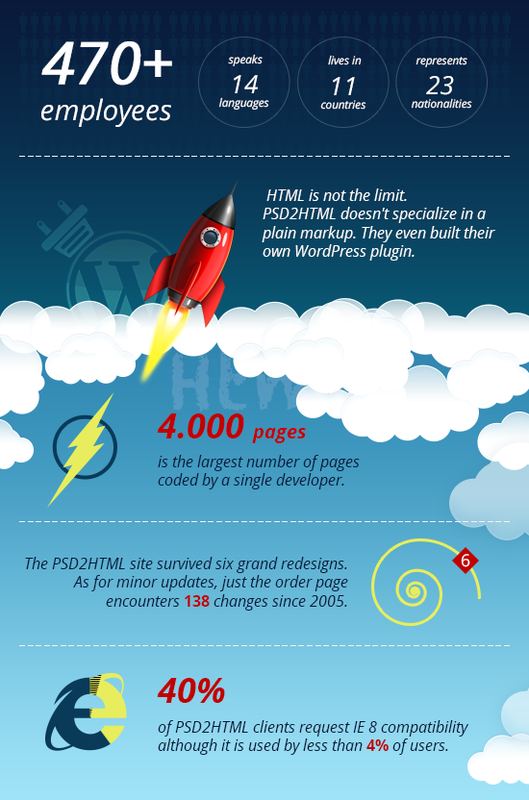 Stas Gurin set this record on the fifth year of his career at PSD2HTML, and it hasn’t been beaten yet. The PSD2HTML site survived six grand redesigns. As for minor updates, just the order page encounters 138 changes since 2005. 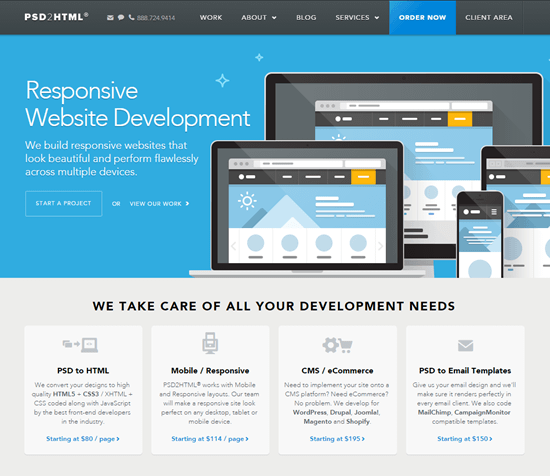 Today, two of our readers get the chance to win $300 and $200 worth of PSD2HTML services. The winners will choose freely which services they want to make use of. Entering is as easy as leaving a comment. To double your chances of winning spread the word about this contest on Twitter and post a link to your tweet below. This is not mandatory, however. Make sure you use a valid email address. Otherwise we will not be able to get in touch with you in case you win. Our little game runs from now on until Tuesday, 2nd of December 214, 6.00 p.m. CET. Winners will be drawn at random with those who commented a tweet receiving a double chance. Hi. Sounds great! I would like to win this giveaway! Its really great! how I wish I could also win the price! Awesome! We love PSD2HTML !!! Could we win? Hey! Thanks a lot for this awesome oportunity! Thanks for the giveaway Noupe & PSD2HTML!!!! Very interested in some PSD2HTML help! Going to use their service soon to build my blog website! Could always use some credit towards some markup services.